No batter at any level likes getting hit by a pitch. But, the truth is it is not if your young player will get hit, it is when. It is a part of baseball and hitting. Young players need to learn the proper way to take a hit by pitch and overcome the fear. I have seen it happen when a player gets to kid pitch, can’t stand in the batter’s box, and soon his baseball career is…let’s say on hold. There is a proper way to “wear” a pitch. Luckily, Lefty’s dad, moi, has a rusty arm and control is not what it used to be. Just about every time I pitch to him using wiffle balls, I pluck him. Okay, sometimes I mean to, but he does not have to know that. But when I do, I encourage him to stay in the box, turn his front shoulder in towards the catcher exposing his back, turn his head away from the pitcher and tuck down. After enough time this should become muscle memory which is key during a game when there is little time to think, but just react. If your player is approaching or just starting kid pitch level, make sure either you or his coaches work on a hit by pitch drill. Get some wiffle balls and start throwing! 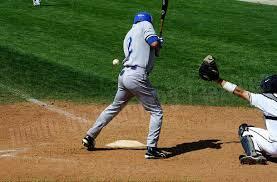 And remind your player, hit by pitch means you get on base. Then you steal 2nd, steal 3rd, get hit home and score a run for your team! First thing I do is find out if the player is right eye or left eye dominate. If he is a right handed hitter and is right eye dominate, he can’t pick the ball up as well unless he opens his stance! We have the kids fully extend both arms out in front of them, make a circle with the hands ( thumb to thumb, index finger to index finger ), pick a stationary object in the distance ( sign, light pole etc.). With both eyes open, shrink the size of your circle with your hands until all you see is the object. Close your left eye, if the object remains in site, you are RIGHT eye dominate. I also practice throwing tennis balls at the kids and hit them! Not hard, but it gets them used to moving out of the way. Pitch tennis balls to them and hit em, every 5 or 6 pitches. Most kids have NO idea what to do when a ball is coming at them.